Knitting has been a passion of Debbie's for over 15 years. Learning at the age of ten, the needles were soon put away as she entered the teenage years, and they remained packed away while she went on to college, raised three children, carted said children to MANY activities, attended grad school, and taught middle school, first as a sixth grade teacher and then as the librarian. She picked up needles again on vacation during the fun-fur faze, after visiting a yarn store with a friend. She hasn't stopped since, and there isn't a city she visits that she doesn't find the nearest yarn store. Debbie recently retired following an educational career of 31 years and decided opening this store would be her "chapter 2". It is her sincere hope that Dances is a place where you find great yarn and also experience a welcoming gathering spot where you just want to sit and share companionship and a cup of coffee with others who love the craft. Welcome! As a young child, Nikki learned the basics of knitting from a beloved aunt. Periodically she would pick up needles and yarn to knit small squares or strips that became little scarves for stuffed toys. Fast forward through the busy years of college, graduate school, work life, marriage and motherhood - the knitting interest continued. When her youngest child started school Nikki decided to learn to knit garments. Twice she enrolled in knitting classes at craft stores only to be disappointed when they were cancelled due to low enrollment. Not willing to give up on yarn and sticks, she bought a book, some bright, fabulously pink Anny Blatt 100% wool yarn and knit a cardigan. There are mistakes in that cardigan and the finish work is imperfect. However, so much has been gained – knitting friends, a whole world of fiber, the sharing of knitting skills and the life long learning of new skills. In addition, Nikki realized a valuable lesson with that solo project. It is one that she would like to share with all would be knitters. That is, that there is little to no risk in knitting. It is a forgiving, fun and exciting personal art form which yields great reward. After years of happy knitting, Nikki still wears that imperfect sweater on cold winter days while preparing supper or puttering around the house. By the way - the color is still fab! Erin didn't have a grandmother, mother, or anyone else teach her to knit as a child. She didn't pick up her first set of needles until her early 20s, when she purchased a “Learn To Knit” kit at a big-box craft store on a whim. The yarn wasn’t the best quality, one of the aluminum needles was a little bent, and the book’s pictures were terrible. (Fun fact: For the first couple of years she twisted all her knit stitches without realizing!) But something about the hobby just captured her. Thirteen years later, she refers to her knitting as a “lifestyle” and is never without multiple projects on the needles. Three years ago another kit introduced her to spinning yarn, which quickly built into another beloved hobby. Now entire sheep fleece follow her home from festivals, and she adores all aspects of the fiber world! Karen learned how to knit as a child. Taught by her aunt, she used to stand over her shoulder to watch her knit. As a child, she used to make her father take her to yarn shops to buy yarn. Karen started with hats which consisted of a simple band (no pattern! ), making them long enough to go over her ears and chaining a cord long enough to tie underneath the chin. She started working for yarn shops when she moved to Richmond 25 years ago. Many of you may recognize her from the Yarn Lounge. Favorite thing to knit…sweaters. When you come in, she will surely be sporting her latest creation! Joyce started knitting in her 30’s. She dabbled in crewel work and crochet, but she wanted to try something new. Finding a beginning knitting class with a teacher from Belgium, she was hooked! Her class project was a sweater on 14 inch straight needles held under her armpits. Since then, Joyce has made many a garment, and her favorite things to knit are wraps and children’s clothing. She loves the calmness and peacefulness that comes with the rhythm of the needles. Rachel remembers growing up, watching her mother make all sorts of things-- Halloween costumes, baskets, needlepoint pillows, woven placemats. At some point, she taught Rachel some basic crochet stitches. After that, Rachel didn't crochet frequently, but she had fun making occasional projects--mostly simple scarves for herself or high school and college friends. Sometime in college, she took her first Learn to Knit class, which was an abysmal failure. (It turns out that straight needles are her nemesis, especially the really long ones). Despite this, she kept trying and started reading knitting books and blogs. She still has the very funny looking scarves from this time period stuffed into the back of a closet somewhere. 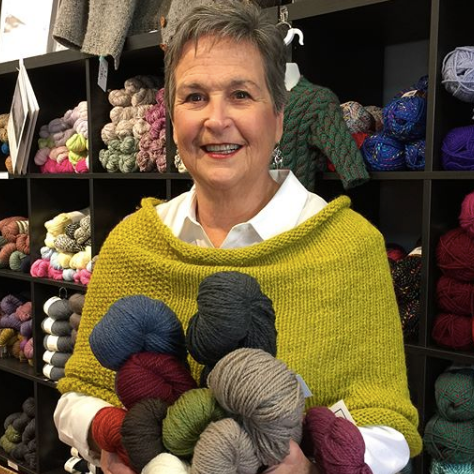 After moving to Blacksburg in 2011, she was determined to get it right and one of the first places she found was the local yarn store. A dozen ruffle scarves and a cowl class later, Rachel was a knitter! Everyone she knew got a hat or scarf for Christmas that year. Four months and several shawls, a pair of socks, and a Baby Surprise Jacket after that, she started working at the yarn store. In 2013, a friend gave Rachel a spinning lesson, which was a start of a new obsession. Rachel is a process knitter (and spinner)-- all things wooly are a joy. Her favorite knits to make and wear are shawls. Located in beautiful Sycamore Square Shopping Center in Midlothian, VA, come visit us!